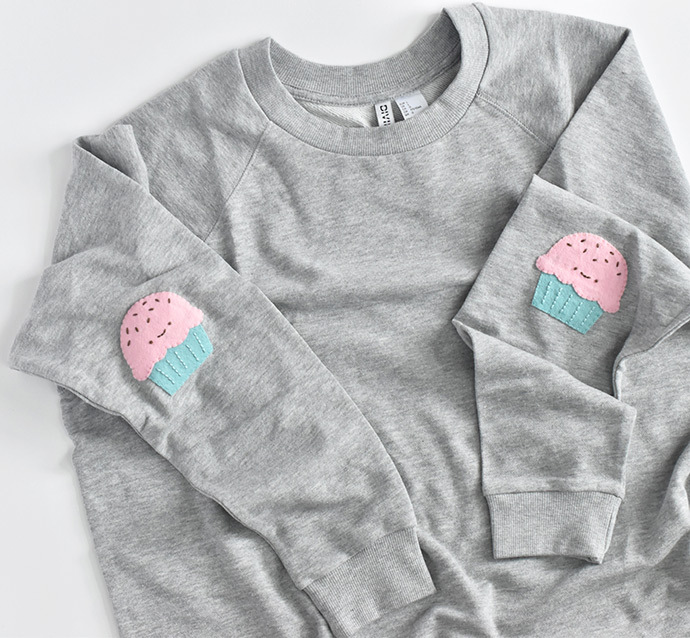 No one loves a hole in the elbow of a sweatshirt, but everyone loves cupcakes. So why not cover patch that hole with a favorite treat? 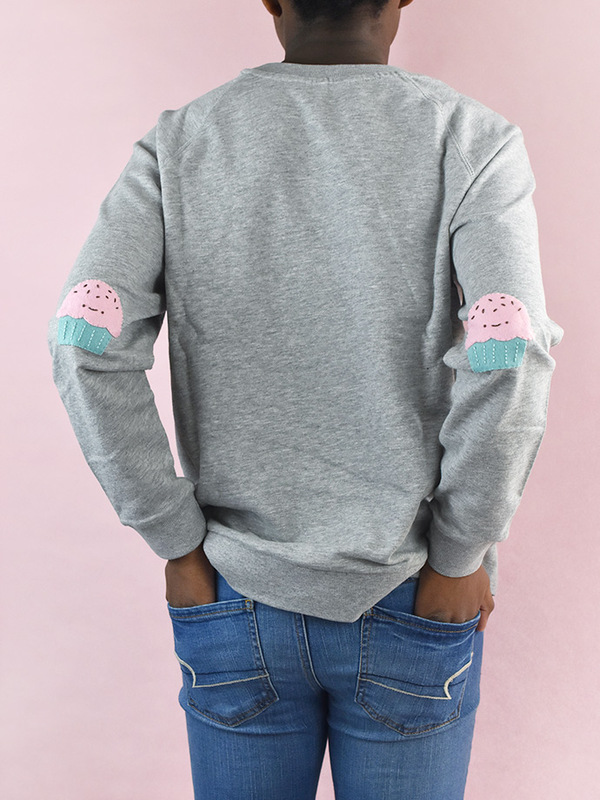 These kawaii cupcake elbow patches are functional and super cute! 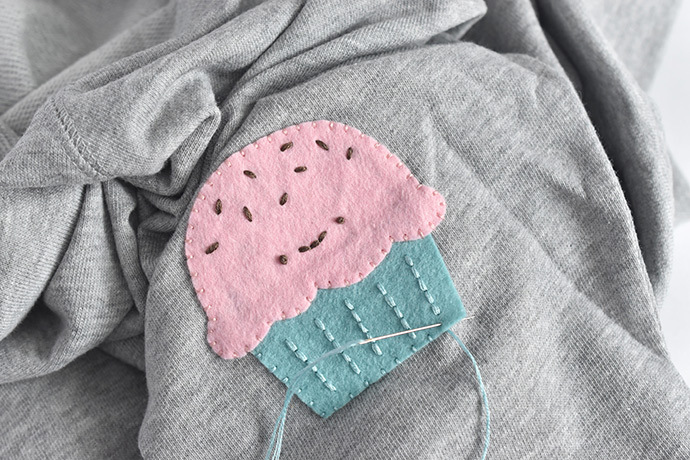 The cupcakes are so cute that you might not want to save this project for when you need to mend a hole. 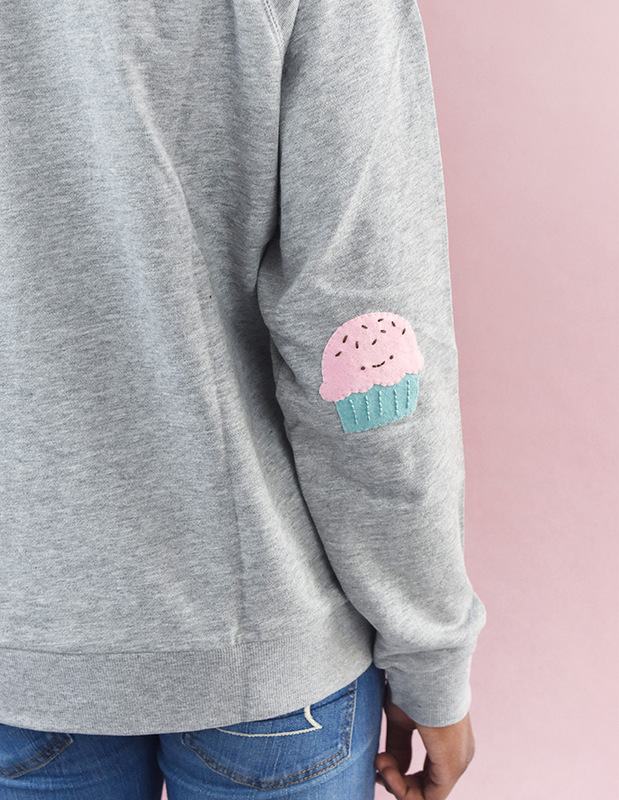 You can add some sweet treats to the elbows of any sweatshirt, sweater, or denim jacket. 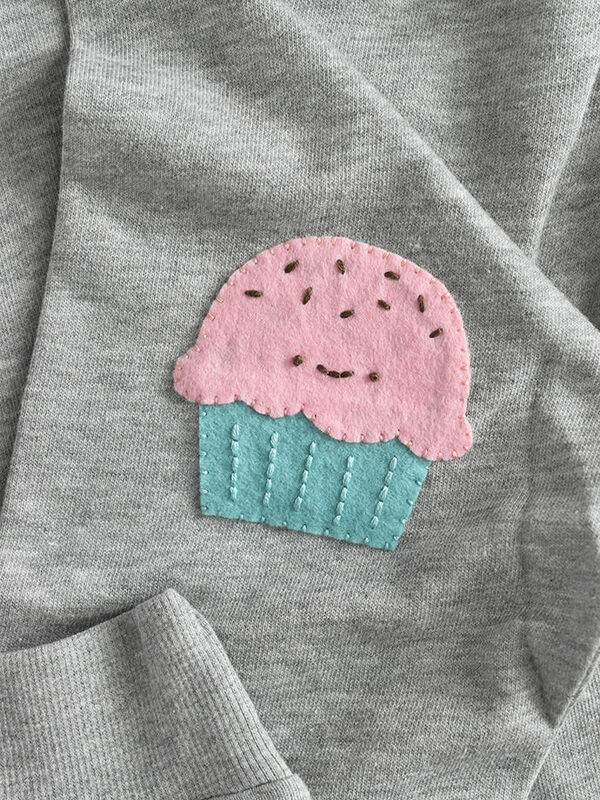 And while we have elbows in mind for this project, you can patch, mend, or cover just about anything with fun felt cupcakes. Don’t be afraid to get creative! 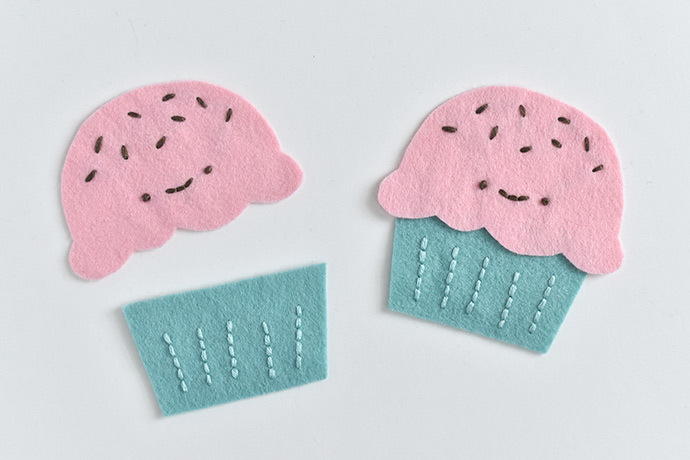 Choose your favorite cupcake flavors of felt and start stitching! Print the cupcake template and cut out two cupcake tops and two bottoms. 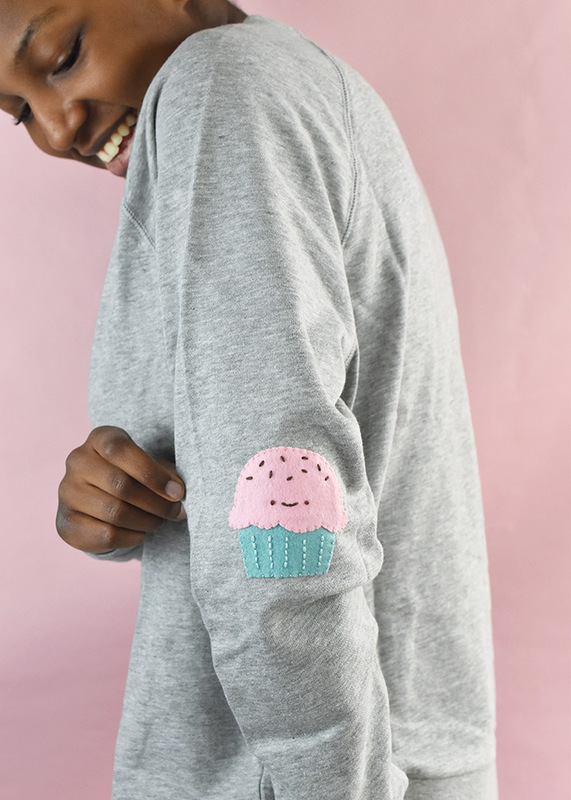 Embroider the lines and faces on the cupcake pieces. Use straight stitches for the sprinkles, french knots for the eyes, and back stitch for everything else. Instead of making all the sprinkles chocolate like the sample, you could also use a bunch of colors for rainbow sprinkles! 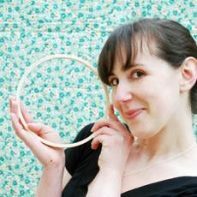 To embroider on the felt, trace the designs on tracing paper, then stitch through the felt and the paper at the same time. After you finish the embroidery, carefully tear the paper away. Mark or mend the elbow. 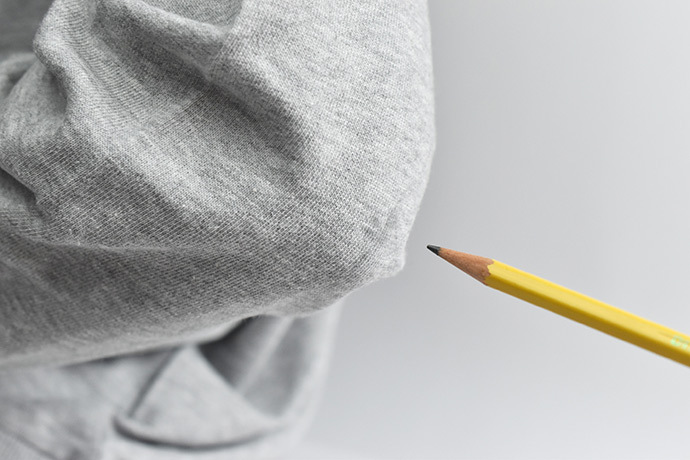 If your sweatshirt has a hole in the elbow, stitch the hole together. It doesn’t have to be perfect because the cupcake covers it. You can also place an iron-on patch on the back of the hole. For elbows without a hole, put the sweatshirt on, then mark where the elbow hits. 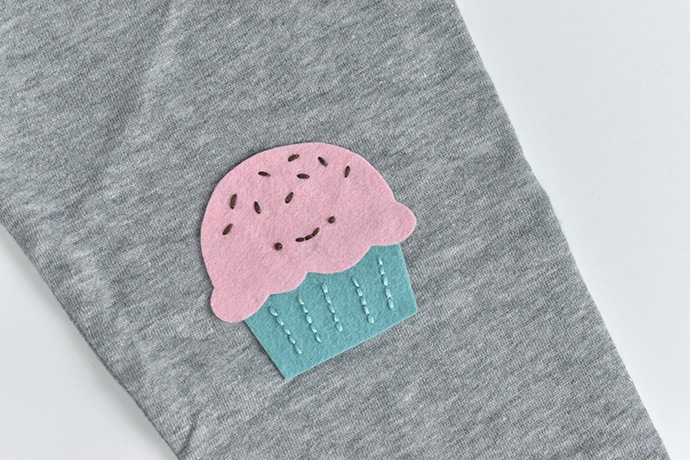 Use fabric glue to attach the two cupcake pieces together. Next, spread a little glue around the back of the cupcake. 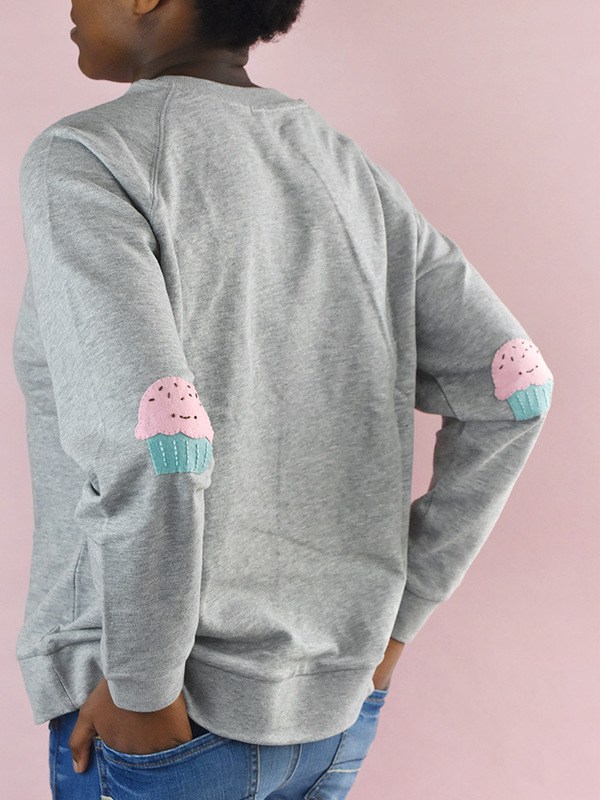 Stick the cupcake patches to the marked or mended areas on the elbows. Let the glue dry overnight. Stitch around the edge of the cupcake, including the lower edge of the frosting. Use three strands of matching embroidery floss and small stitches. It helps to scrunch up the sleeve and work through the opening at the neck. 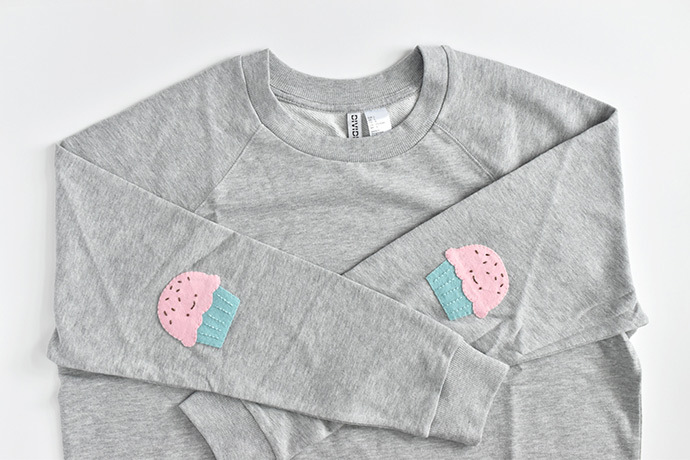 Now your sweatshirt is ready to wear. Get ready to show off those sweet patches! 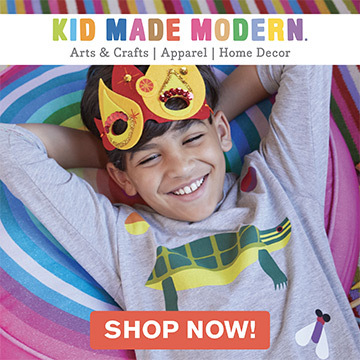 Wool and wool blend felt is washable, but to keep it looking nice as long as possible, give it special care. Always use cold water so the felt doesn’t shrink. For best results, handwash the patched shirt. 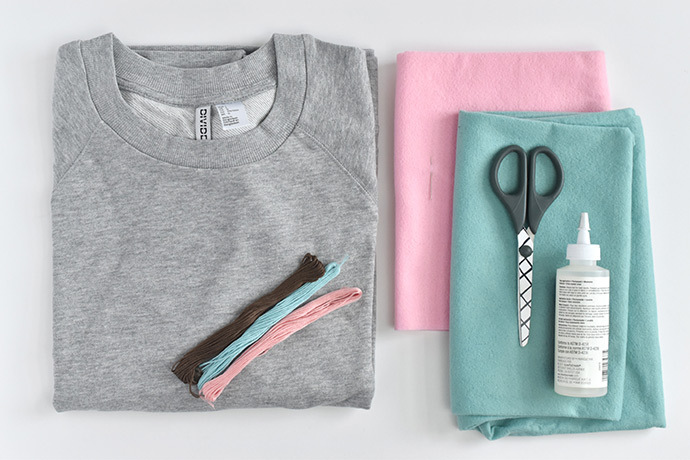 To machine wash, turn the sweatshirt inside out and wash on a gentle cycle. Hang to dry. Elbows aren’t the only places that need patches. 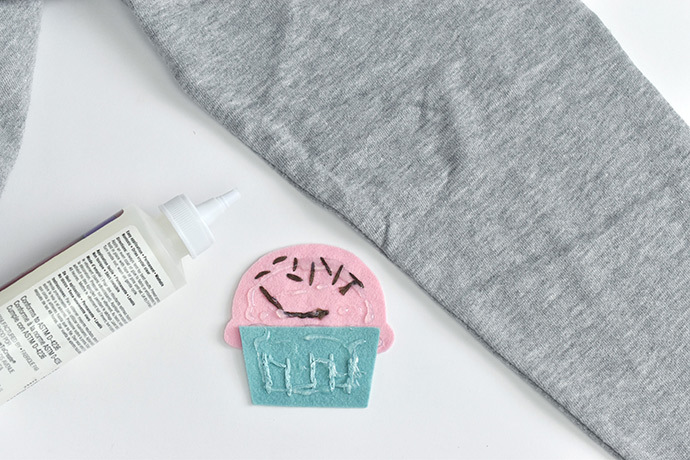 Add a cupcake to a pair of jeans or to cover a stain on a t-shirt. 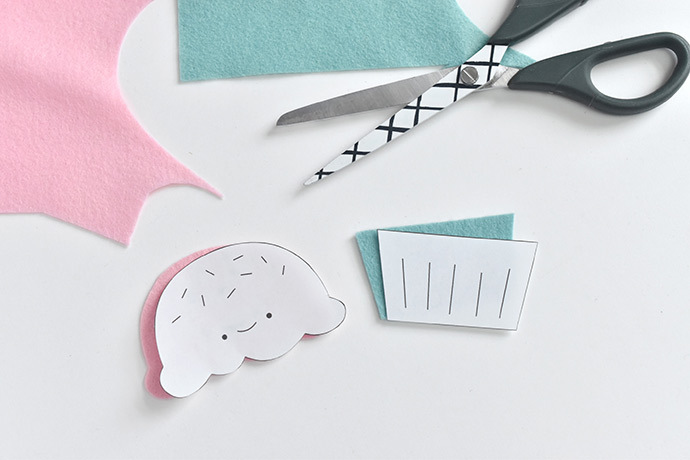 Of course, you can also make other fun felt patches too!